Dough is mixed with a unique, shafless mixing blade that ensures good dispersion of ingredients. 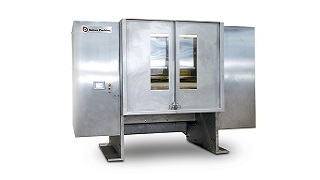 Mixed dough is automatically discharged into a dough feed system or tub. In many facilities, the mixer is located on the floor above the main line: mixed dough is discharged into the dough feed through a floor chute. 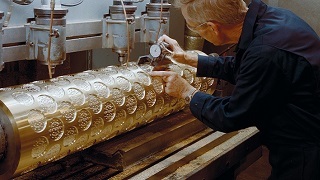 Dough and filling are fed down passages machined into filler blocks to create a continuous strip of filled product. A third product stream can be added via a pump. Cuts the continuous strip of product into bar lengths. Product length is easily and quickly adjusted between bite size and full size bars. Baking is achieved by jets of hot air directed onto the product from plenum chambers above and below the band. 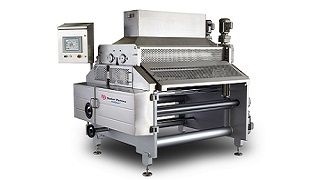 The air is heated by a single burner in each zone and, once spent, is recirculated with a proportion being exhausted to maintain bake chamber humidity. High pressure in the plenum chambers ensures even distribution of air across the band, providing an even bake. There is significant growth potential in the bar market, with room for new products in the health, diet, and indulgence sectors. The key to sustained growth and market share is to continually add interest and variety, and Baker Perkins offers proven equipment that enables imaginative manufacturers to extend their product range. Baker Perkins' TruClean™ Wirecut allows filled bars to be produced with an unlimited variety of sweet and savoury fillings, including low fat options. 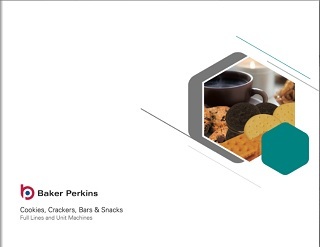 Baker Perkins' equipment offers an extensive choice of shapes, profiles, fillings and toppings that provide a welcome relief to the conventional brick shaped bar. It also accommodates ingredients with recognized health benefits such as whole grains, nuts, fruit pieces, low-carb crispy pieces, fibre, soy and whey protein. 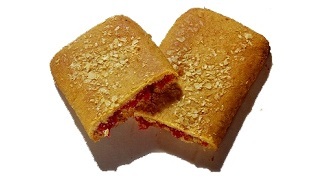 A key factor in differentiating bar products is baking. This allows the development of flavours, colours and a variety of textures not achievable with cold forming techniques. Baking adds interest to the sector and is likely to increase in popularity as consumers’ tastes in bars develop and they look at products offering greater taste and variety, without sacrificing the health or convenience benefits. 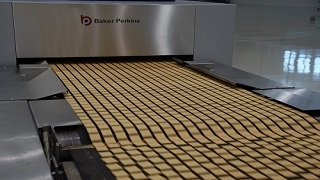 In addition to providing new systems, Baker Perkins can convert existing cookie and biscuit systems to produce bars, without large scale investment. View some of the many bar products that can be made on Baker Perkins' process lines. If you have a cookie, cracker or snack product idea that you would like to produce, give us a call.